The Radio Flyer® Fold 2 Go Trike is a wonderful, award-winning children's toy. No assembly is required. The construction design of this tricycle makes for easy storage with its collapsible framing. It also has a safety latch to make sure that the tricycle doesn�t fold while riding. The storage bucket on the back can be filled with favorite toys, sand, dirt, or can even be used to give the family pet a ride. 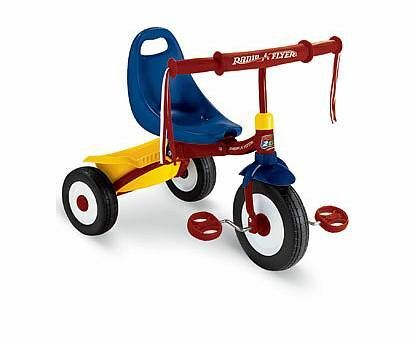 Body: 24" x 15" x 19"
Front Wheel: 8 1/2" x 2 1/4"
Rear Wheels: 6 1/2" x 2"